General chat » Anybody up the oaks at all tomorrow? Mile Oak » Archive » General chat » Anybody up the oaks at all tomorrow? I will be around from 9 until 4ish? Anybody else thinking of coming up? I wish, I've got 2 guns that need setting up before Sunday. 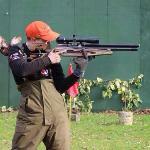 Just hope the weather is good and Buxted have a half decent plinking range.